When you hire the right wedding DJ to entertainment your guests, you’ll have an event that they won’t soon forget. A romantic ceremony, a beautiful bridal gown and a delicious meal are all important elements that will set the tone for your big day. But none of them will have as large an impact as the style and mood of the music and entertainment you provide. That’s where a professional wedding DJ can be essential. Will your guests sit around and talk throughout your reception, or will your music be lively enough to inspire them to get up and groove to the beat? The skill of the wedding DJ will usually affect the answer to this. The best weddings, run by the most successful DJs, are those where people end up spending most of the time on the dance floor, swinging their hips and moving their feet. The good news is that wedding disc jockeys are in large supply these days, but it’s important to know that not all are the same. The level of experience, quality of equipment, selection of music and price can all span a very wide range. Good wedding disc jockeys are those who will be comfortable entertaining your guests and will take into account a wide array of tastes. The wedding DJ will not only be in charge of your entertainment but will also emcee your event, handling details such as introducing you in your new role of husband and wife, and giving various special announcements. He or she may also lead some special dances and games to help keep the energy level high. What all this means is that you should look like someone with a personality and style you like, as well as and a music collection that appeals to your taste. In addition, you’ll want to be sure that any wedding DJ you hire will have professional equipment to provide the highest-quality sound that’s appropriate for your reception space. When shopping for a wedding DJ, you can find people who bring all different levels of experience to the microphone, from those who do this as a part-time hobby or gig to large-scale companies with multiple wedding disc jockeys available who can also provide other wedding services, including planning, coordination and set-up and break-down. Regardless of how well-known a wedding DJ is, you’ll want to find someone who comes highly recommended. Other newlyweds can be a good source to guide you on this. With any wedding disc jockeys you’re considering, it’s important to meet with him or her and go over your wedding details and music taste. You’ll also want to talk about the age and interests of your guests and mention any special songs or traditions you want to incorporate into your event. Finally, you can also explore the option of incorporating some extra details, such as special lighting or colored smoke or fog, a raised stage and dancers to bump up the “wow” factor of your day. There are a variety of different approaches you can take to locate a good wedding DJ in your area. You can ask your other wedding vendors for recommendations, look in the yellow pages or do a search online for wedding disc jockeys. In addition, family and friends can refer you to people they’ve used, or you can attend wedding expos and talk to wedding disc jockeys who have booths set up at these shows. In addition, the American Disc Jockey Association provides a searchable directory of its members. Other options include various popular wedding plan websites, such as The Knot, My Wedding, Wedding Channel, and Martha Stewart Weddings. When interviewing wedding disc jockeys, you’ll want to ask about the quality of the equipment they use. It’s important to make sure that the sound quality will be excellent and that it will be an appropriate level for the size and logistics of your room. You’ll also want to also what technology the disc jockey will use to provide the music. Finally, make sure that the wedding DJ is insured in case of some type of accident or damage occurs during your reception. Before you sign a contract with a wedding DJ, you’ll need to know exactly what’s included in the wedding DJ entertainment package. Typically, this should cover a planning consultant, play list tailored for your specifications, CD player (or players), audio mixer, microphone, set-up, play time (4 hours is standard) and break down. Some DJs will charge an hourly rate for overtime. In addition, some will be willing to play at your rehearsal dinner for an extra fee. Make sure you ask your wedding DJ to include all of the wedding details in writing so you won’t have any questions later. Some couples prefer to hire a live band, not a wedding DJ, to entertain their guests. There are some pros and cons to each option, so you’ll need to think about your priorities and determine which option feels like the best fit for your needs. The cost of wedding disc jockeys is usually more affordable than using a live band and also offers more versatility in the music, enabling you to incorporate all your favorite songs into your day. On the flip side, though, wedding bands provide live music coursing through the room and usually have a distinctive style, yet they cost more and also may not be able to play your favorite popular songs exactly the way you like. It’s worth noting that since many wedding couples see the benefits in both options, it’s a growing trend today to incorporate both a wedding disc jockey and also a cover band into the reception. When using both forms of music, you will usually want to give each their own designated part of the event (rather than alternating between them). If your budget permits this luxury, it’s a great way to get the best of both worlds. The cost for a wedding DJ depends on a number of factors. The level of experience the wedding DJ brings to the job, the quality of the equipment, how long he or she will play and what area of the country you live in can all affect the price. 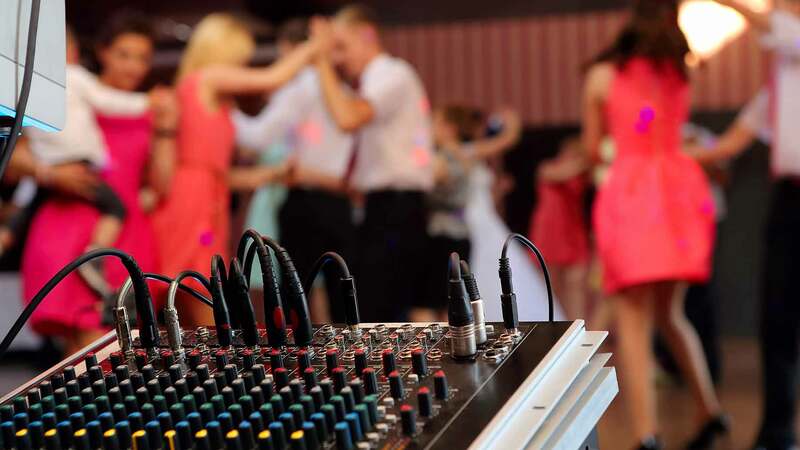 For shorter events, the wedding disc jockey price may be on the higher end of the scale per hour in order to make the gig worth the DJ’s time, while for longer events, the wedding DJ price is often a per-hour rate that may be on the lower end. Further, wedding disc jockeys that bring special effects, such as colored light machines, fog and dancers will be on the high end of the scale, and some of the most experienced, or with the most elaborate equipment and capability, may even charge more. So for a four-hour wedding, you can expect the price for a wedding DJ to be between $600 and $1,600 or more. Note that some wedding disc jockeys that are traveling a long distance will also require an additional fee for travel. In addition, meals are often provided to vendors working for the reception. You can talk to your caterer about this. If you can’t find room in your budget to cover the cost of a wedding disc jockey, there are a few other options to consider. You could rent a jukebox that comes with popular music already loaded on it. This ranges from $300 to $400 for an event. You can also use an iPod with a sound system that amplifies the music. You can usually rent an iPod sound system for $150 to $200. This latter option is best for a very small event, though, since the sound won’t be loud enough for a large room with many guests. Finally, you can rent a professional quality CD player with 4 trays, mixer and speakers for about $200 to $300 if you want to provide your own equipment and have a friend serve as your wedding DJ instead of hiring a professional.